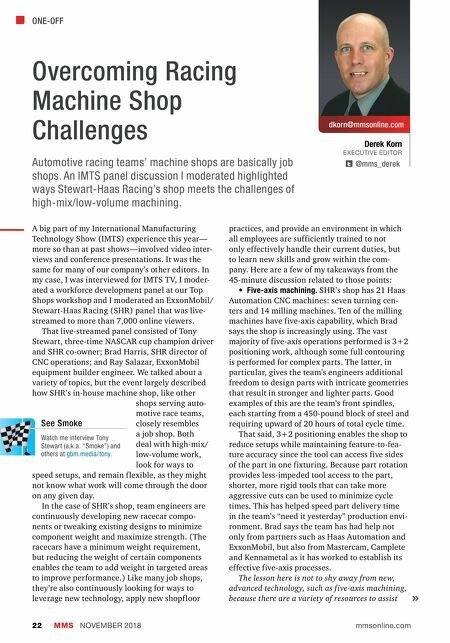 ONE-OFF MMS NOVEMBER 2018 22 mmsonline.com dkorn@mmsonline.com Derek Korn EXECUTIVE EDITOR @mms_derek Overcoming Racing Machine Shop Challenges Automotive racing teams' machine shops are basically job shops. An IMTS panel discussion I moderated highlighted ways Stewart-Haas Racing's shop meets the challenges of high-mix/low-volume machining. A big part of my International Manufacturing Technology Show (IMTS) experience this year— more so than at past shows—involved video inter- views and conference presentations. It was the same for many of our company's other editors. In my case, I was interviewed for IMTS T V, I moder- ated a workforce development panel at our Top Shops workshop and I moderated an ExxonMobil/ Stewart-Haas Racing (SHR) panel that was live- streamed to more than 7,000 online viewers. That live-streamed panel consisted of Tony Stewart, three-time NASCAR cup champion driver and SHR co-owner; Brad Harris, SHR director of CNC operations; and Ray Salazar, ExxonMobil equipment builder engineer. We talked about a variety of topics, but the event largely described how SHR's in-house machine shop, like other shops serving auto- motive race teams, closely resembles a job shop. Both deal with high-mix/ low-volume work, look for ways to speed setups, and remain f lexible, as they might not know what work will come through the door on any given day. In the case of SHR's shop, team engineers are continuously developing new racecar compo- nents or tweaking existing designs to minimize component weight and maximize strength. (The racecars have a minimum weight requirement, but reducing the weight of certain components enables the team to add weight in targeted areas to improve performance.) Like many job shops, they're also continuously looking for ways to leverage new technology, apply new shopf loor practices, and provide an environment in which all employees are sufficiently trained to not only effectively handle their current duties, but to learn new skills and grow within the com- pany. Here are a few of my takeaways from the 45-minute discussion related to those points: • Five-axis machining. SHR's shop has 21 Haas Automation CNC machines: seven turning cen- ters and 14 milling machines. Ten of the milling machines have five-axis capability, which Brad says the shop is increasingly using. The vast majority of five-axis operations performed is 3+2 positioning work, although some full contouring is performed for complex parts. The latter, in particular, gives the team's engineers additional freedom to design parts with intricate geometries that result in stronger and lighter parts. Good examples of this are the team's front spindles, each starting from a 450-pound block of steel and requiring upward of 20 hours of total cycle time. That said, 3+2 positioning enables the shop to reduce setups while maintaining feature-to-fea- ture accuracy since the tool can access five sides of the part in one fixturing. 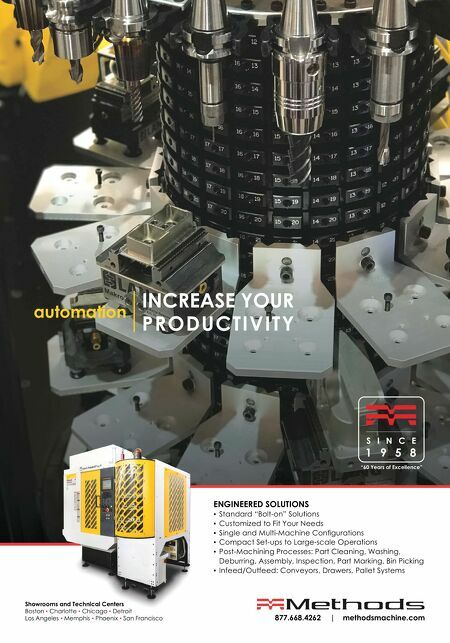 Because part rotation provides less-impeded tool access to the part, shorter, more rigid tools that can take more aggressive cuts can be used to minimize cycle times. This has helped speed part delivery time in the team's "need it yesterday" production envi- ronment. Brad says the team has had help not only from partners such as Haas Automation and ExxonMobil, but also from Mastercam, Camplete and Kennametal as it has worked to establish its effective five-axis processes. The lesson here is not to shy away from new, advanced technology, such as f ive-axis machining, because there are a variety of resources to assist See Smoke Watch me interview Tony Stewart (a.k.a. "Smoke") and others at gbm.media/tony .